Make a splash in my feisty, feminine Papillon collection in eye-popping orange or beautiful bright blue. This playful design offers the perfect fit for any body type! 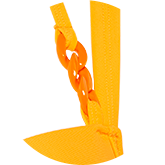 And how adorable are the straps, enriched with stylish, interlocking rings? 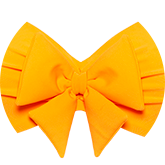 But the real eyecatcher, of course, is the fabulous statement bow that decorates the center of your décolleté. Trop mignon! Wear my Papillon collection and dare to dazzle!